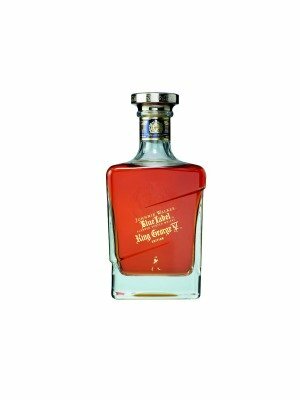 Johnnie Walker Blue Label King George V Edition Whisky is a popular Whisky available from TheDrinkShop in 70cl to buy online. Visit TheDrinkShop for the best price for 70cl of Johnnie Walker Blue Label King George V Edition Whisky or compare prices on our other Whisky products. A beautiful amber colouring offering a delectable nose of heady toffee apple and very faint smoke with dashes of thick, syrupy malt and digestive biscuits. The palate is soft offers buttery toffee mixed general fruitiness. Medium bodied, but very malty the finish hints at syrup with malt on the end. Where to buy Johnnie Walker Blue Label King George V Edition Whisky ? Johnnie Walker Blue Label King George V Edition Whisky Supermarkets & Stockists. You can buy Johnnie Walker Blue Label King George V Edition Whisky online in most retailers and find it in the Whisky aisle in supermarkets but we found the best deals online for Johnnie Walker Blue Label King George V Edition Whisky in TheDrinkShop, DrinkSupermarket.com, and others. Compare the current price of Johnnie Walker Blue Label King George V Edition Whisky in 70cl size in the table of offers below. Simply click on the button to order Johnnie Walker Blue Label King George V Edition Whisky online now.